Today I’m going to show you two business development companies (BDCs) that were great buys once but now need to be banished from your portfolio right away. They’re all good companies, but recent market fervor has caused them to be way overpriced. And while the bull run has been good for all BDCs, there is still one I still see as underpriced relative to its potential. First, we need to talk about Main Street Capital (MAIN), one of the best-performing BDCs out there … and one of the world’s most crowded trades. MAIN’s fundamentals still look great. The problem? Its massive price growth in recent months means it’s way too expensive. On a total-return basis, the BDC has outperformed conventional lenders like Wells Fargo & Co (WFC) and Citigroup Inc (C), as well as investment pros like Blackstone Group LP (BX) and Lazard Ltd (LAZ). Last quarter, MAIN’s net asset value (NAV) per share rose 2%, to $21.24, but the stock price jumped 12%. And the shares have risen another 20% since then! 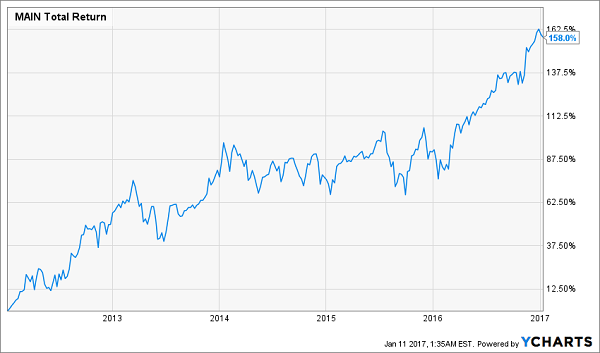 Now, Main Street is priced at a whopping 71.8% premium to NAV, making it laughably overpriced—and at risk of a significant correction. 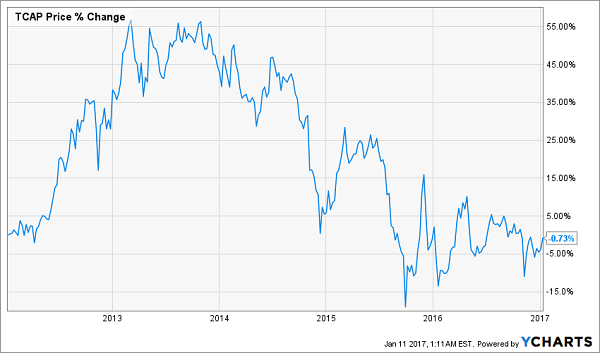 Another BDC I recommend selling is Triangle Capital Corporation (TCAP), a 9.5% yielder I used to find attractive because it’s so boring. 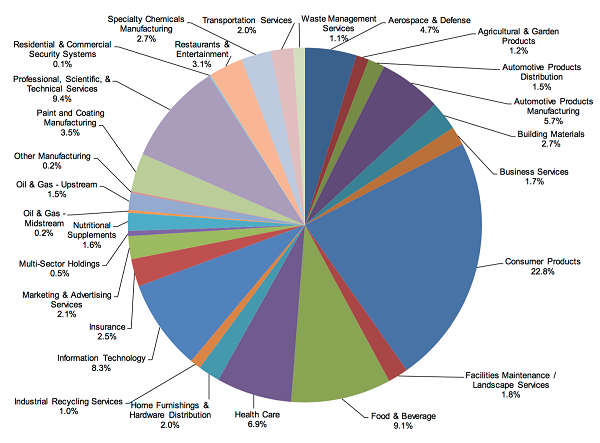 The great thing about TCAP is that it’s widely diversified across all industries, as you can see from the chart above. Then, TCAP suffered a 13.4% decrease in investment income in the first quarter of 2016, resulting in a 16.7% dividend cut that took investors by surprise. While the market was panicking, I bought shares in TCAP shortly after the dividend cut and have seen modest single-digit returns since. But I’ve since sold because TCAP is now trading at a 24.5% premium to NAV, even though its payouts are just barely covered by net investment income (its payout coverage is actually 98.9%). That’s just not good enough, so I’m now waiting for a discount to NAV to come back or for TCAP’s payout ratio to improve. I don’t expect either in the short term. 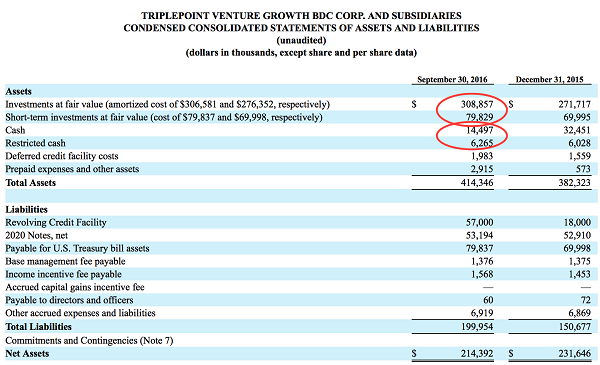 That’s the TriplePoint Venture Growth BDC Corp (TPVG), which has been one of my favorite BDCs for a long time. I first bought shares in April and doubled down a few months later. I’m up double digits on that investment and have been getting a double-digit yield, too. TPVG’s chart looks parabolic, and that might convince you to sell. But it’s still too early. The company grew its NAV per share by 3% in the third quarter of 2016, and I’m confident its NAV is going to keep increasing. That means the 31% discount to NAV that you could have gotten a few months ago is gone, but in its place is a still-respectable 8% discount to NAV. Either way, I believe TPVG is worth buying at a premium to NAV for one reason: its management is delivering a return on investment that’s much better than it first appears. TPVG has $414.3 million of assets in total, but 5% of those assets are not invested at all. The company’s annualized investment income looks to be about $47 million by the end of the third quarter of 2016, meaning it’s earning 12.1% on its invested assets. This is an incredible return, but the company’s yield is likely to go up. In the third quarter, TPVG lent $69 million to businesses, and those loans will return a weighted average of 15%. Since the company is still in a position to make strong investments, it will continue to earn more than its dividend (its coverage is now 102% and has been rising for several quarters). TVPG remains a surprisingly safe buy for a stock that yields 11.6%. BDCs may offer tantalizing yields, but many—like Main Street and Triangle Capital—boast too-good-to-be-true payouts that could be slashed at the drop of a hat. Sure, you could find safer yields among the so-called Dividend Aristocrats of the S&P 500, but you’ll give up a lot for that “safety”: many of these companies are shadows of their former selves, dribbling out sub-2.0% yields and pathetic $0.01-a-year payout increases. I think you’ll agree this is no way to build long-term wealth. That’s why we’ve built a brand new income portfolio that throws off a safe—and growing—8.0% income stream, or about four times higher than what your average Aristocrat pays! To put that in dollars and cents, it starts you off with a solid $40,000-a-year income stream from just a $500,000 nest egg. Sure, that yield is less than the 11.6% you’d get from TPVG, but that’s a small price to pay for the unbeatable diversification this unique portfolio offers. It’s built on 6 proven money-makers from wildly different corners of the market. That helps protect your nest egg while it generates a rising stream of income for you! We took the wraps off this powerful new “8.0% retirement portfolio” just a few weeks ago, and I can’t wait to show it to you. Simply go right here to get all the details—including details around the 6 unsung income wonders it’s built on—now. Article printed from InvestorPlace Media, https://investorplace.com/2017/01/2-dangerous-dividends-to-sell-now-and-1-safe-11-6-yielder-to-buy/.